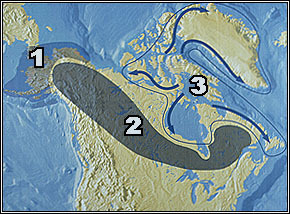 The Palaeo-Eskimos flourished throughout Arctic North America, from Alaska to Greenland. At times they penetrated Subarctic regions, claiming territory as far south as the Pacific coast of Alaska, the northern forests of Saskatchewan and Manitoba, the Labrador coast and the island of Newfoundland. Most of these southern expansions occurred during the early period of Palaeo-Eskimo occupation, between about 2500 and 1000 B.C. By 500 B.C., when the Dorset way of life developed, the Palaeo-Eskimos had withdrawn to a smaller and more isolated region. Dorset culture occupations occurred along the Arctic coasts from Coronation Gulf in the Central Arctic, across Hudson Bay, down the coast of Labrador to Newfoundland, and northwards across the Arctic islands to Greenland. Along the boundaries of this area, the Dorset people may have had occasional dealings with other peoples: the Innu and Dene Indians of the northern forests, and their own distant relatives who occupied the Western Arctic regions to the west of the Mackenzie River. Yet these contacts must have been sporadic and occasional; between 500 B.C. and A.D. 1000, the Dorset way of life seems to have developed in virtual isolation from the rest of the northern world.